The Mini Solar Racer is a toy car which claims to be the world’s smallest solar powered car. The solar panel allows the car to move from eco-friendly solar energy when the car is placed either in sunlight or under a bright artificial light. The Mini Solar Racer is a helpful toy to demonstrate both the abilities of solar power and the advancements in technology that allow a solar powered car to be made to such a significantly small size. 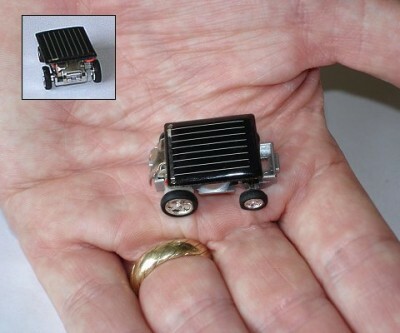 The toy car measures an astonishing 3.3 cm x 2.2 cm x 1.4 cm (1.3 in x 0.87 in x 0.55 in) which does mean its not suitable for children under 3 due to small parts (up to and including itself!). 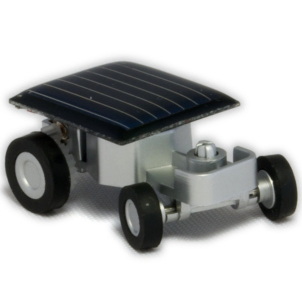 The Mini Solar Racer has a solar panel positioned on the top of it, this makes use of any light around, be it sunlight or bright artificial light and converts it into electrical energy. The electricity powers the motor within the toy, which turns the wheels, causing the car to move. The toy car can help to show the impact even small amounts of light can have, to help educate children about the abilities of eco-friendly energy it is best to demonstrate the car with sunlight. The Mini Solar Racer is a fun toy car that will entertain both adults and children. The toy can be used as an educational aid as a child can witness the abilities of solar power and the remarkable size the technology for a toy car can be created in. The Solar Racer costs just £9.95.